Blue Jasmine, Woody Allen’s 2013 film, is just over three months away from it’s US premiere, and we are slowly getting more images and information. We have a new image of lead Cate Blanchett, the ad that ran in the LA Times that could give us a clue to the poster and new release dates for other markets. First is a new image of Cate Blanchett. she’s the lead for the new drama, and it’s certainly the darkest and broodiest image we have so far. It is the seventh photo we’ve seen of from the new film. Another new image from the film was released this week, but only in print. 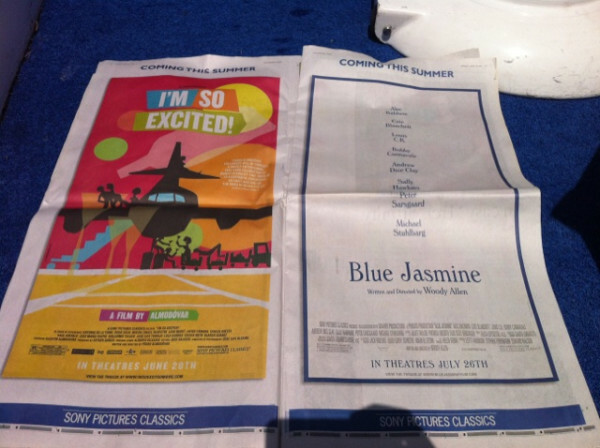 Sony Pictures Classics took out full page ads in the LA Times this week to promote two of their summer films – Pedro Almodovar‘s ‘I’m so Excited‘ and ‘Blue Jasmine‘. The image used to promote ‘Blue Jasmine‘ is our first hint at what a poster will look like. Or is it? It’s the standard Woody Allen film font, and the centred look and cast name in alphabetical order are all design tricks we’ve seen before. They’ve used a blue colour to tie in with the film’s name (we presume), and it seems like otherwise all is normal in Allen’s world. This style is so embedded that it would have been pretty easy for an artwork person to mock this up. We are expecting to see a full poster very soon. 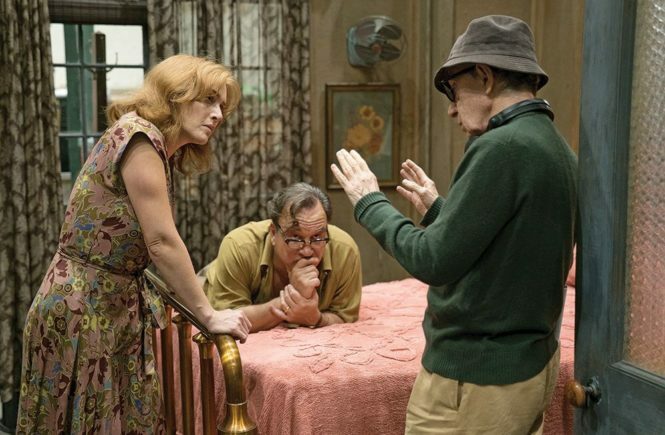 Bobby Cannavale was recently interviewed by Newsday, and in the interview he discussed Woody Allen. And how was Woody Allen? Some find him intimidating. About three weeks later, he sent over my scenes in a manila envelope. I had an hour to read them, then give them back. He sent a note saying, “Take a look — if you don’t like it, you can pass. 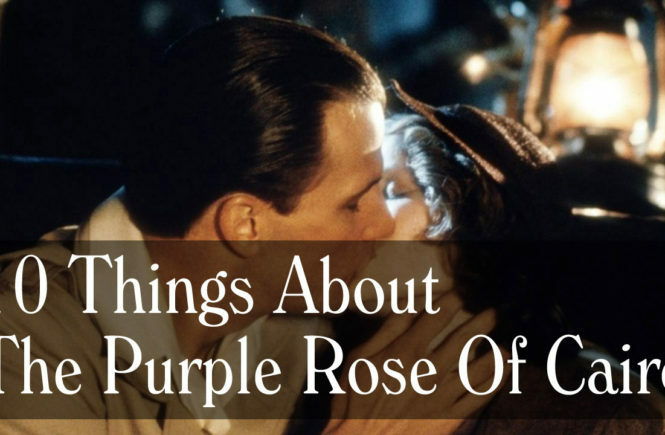 But I’d love for you to do it.” It was amazing watching him work. I just wanted to remember it. We also have some new release dates. The US limited release is 26th July, in New York and Los Angeles only at this point. Now the Seattle Times has announced it will open in that part of the Us on 16 August. It makes sense – a limited release that rolls out across the US over the coming weeks. On the international side, IMDB has added Portugal to it’s release dates, as September 5, earlier than the UK or France. Finally, the MPAA has released ratings for ‘Blue Jasmine‘ – PG13. Which means there’s a finished cut doing the round! And a serious drama it may be, but it’s not the R rating that was on films such as Husbands And Wives. We are still waiting for that proper poster and a trailer. They usually do not come any later than three months out, so we are expecting it to hit any day now. We will post it up as soon as we get it. Check out all our Blue Jasmine coverage. What do you think of the new pic?